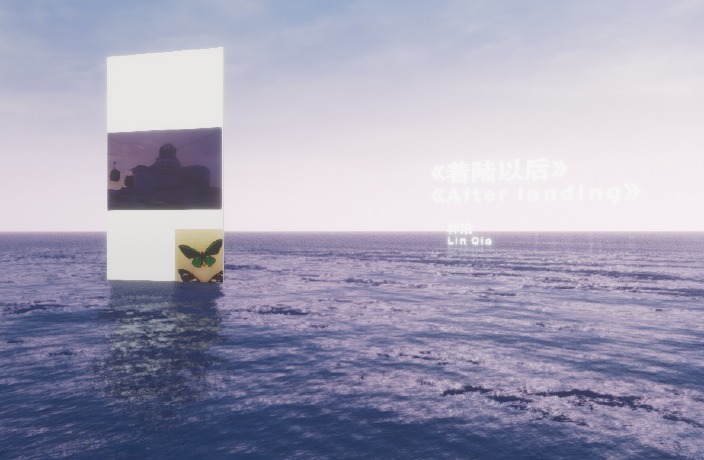 In early January, Shanghai-based digital contemporary art center SlimeEngine launched their programmatic project Ocean, an offline, digital exhibition of 99 artists. Set in the middle of a virtual body of water, the videos, digital sculptures and photographs float ‘inches’ above the water’s surface, with some of them occasionally dipping beneath bobbing waves. Users can navigate between different art pieces via keyboard control, and peruse works by the likes of 33EMYBW, Pixy Liao, Gooooose and Vincent Tanguy. From producer and electronic artist 33EMYBW, you'll find a static, six-armed pineapple stem cut straight from the cloth of her music video of the same name 'Golem' (VPN needed.) Get close enough to the sculpture and the track will play. It's haunting and heavy electronic beat is an unusual pairing with the open seascape. While the work isn't a still of the music video, its relationship to what Radii China's Josh Feola refers to as 3 minutes and 32 seconds of “what happens inside a video game when no one’s playing and the machine is off, dreaming unto itself” opens up thought-provoking dialogues. 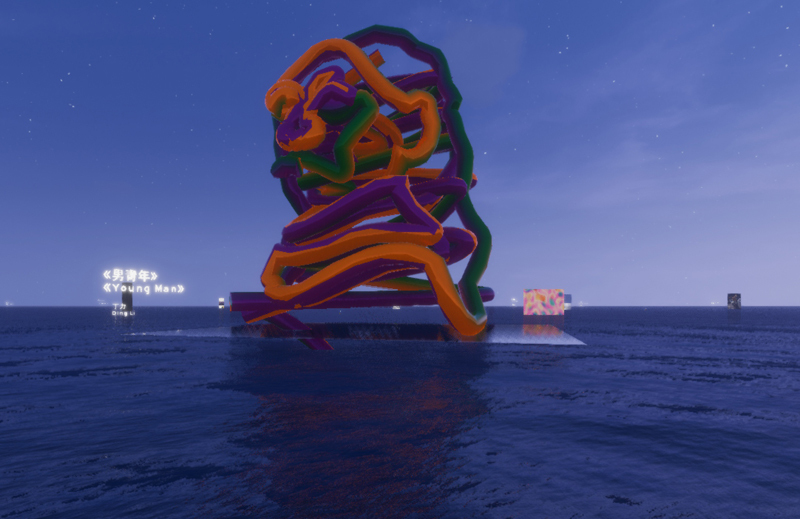 The video is a world of its own, while the sculpture exists in a nameless, faceless and seemingly endless ocean void - an environment entirely separate from its origin. The sculpture calls attention to the object itself, while the video functions as more of a performance. Are you an actor without agency? An object if you have a time-bound start and end? While these are questions we don't have answers to, there's something exciting about a platform that reframes conversations about art, space and digital media, inviting comparisons and recontextualizing familiar terms in what feel like novel ways. Move away from the work and the soundtrack abruptly cuts out, replaced by the lull of the waves lapping against themselves. Mobile works and videos are only activated when you are within a certain radius, leaving the ‘gallery’ space quite calm. Apart from blinking buoys, the only other activity is the changing color of the sky as the sun sets and day turns to night. While some works are more interactive, others are static, which means, as a viewer, you can't really anticipate what's going to happen until you’re there ‘with’ the work. Unlike physical pieces of art in a gallery space, you don’t have the opportunity to see other visitors interact with them, making it solely your responsibility to activate and them. Video projects are stopped and started only for you, so that you can avoid the risk of missing any part of them. It's intimate and impersonal all at once, with abrupt pauses and sharp auditory cuts, confounded by sometimes clumsy computer navigation on the user's part. Video files and photographs easily translate to the digital platform, but other works are derived from 3D, physical projects, translated by the artists into a new format, and uploaded by SlimeEngine. The background stories, and what this project means for the pieces, are as varied as the reactions they elicit. A number of pieces air on the creepier side, but others are downright beautiful or playful. Ding Li's toothpaste patterned sculpture looks like a close encounter with a rough and tumble, old-school Windows screen saver. You can even navigate the controls so that your perspective comes from within the object, although expect quite heavy undulation, and the potential for seasickness. As the sky darkens, the floating titles and names attributed to each of works are easier to read against the backdrop of the night sky. Gliding between the works, the firmament quickly fills with stars and a moon steadily rises, making a journey from what we can only assume is East to West. You can nearly miss the lunar passage altogether if you're not facing in the right direction, that is, until you realize the water, and the works, reflect its light. It's a quiet, user-centric experience that stands in stark contrast with the crowded and often bustling art exhibitions we're used to, here in China. While there are still some kinks to be worked out, the project raises important questions about what we can, and should, expect from institutions and from art, in a novel presentation that you can save to your desktop. You can download the program off a Baidu cloud link to explore this futuristic pixilated show on your own. A$AP is back and so are all the EDM gods. A lot of really good (and really sold-out) shows this week, so keep your eyes on them group chats and see if you can snag one. Rita Ora might be canceled, but there's still plenty on to hit up this week. Irish hip hop (that's free thanks to Vice), one good doggo and Gone With the Wind. Chinese indie music, a Japanese four-man band and a holographic Michael Jackson.